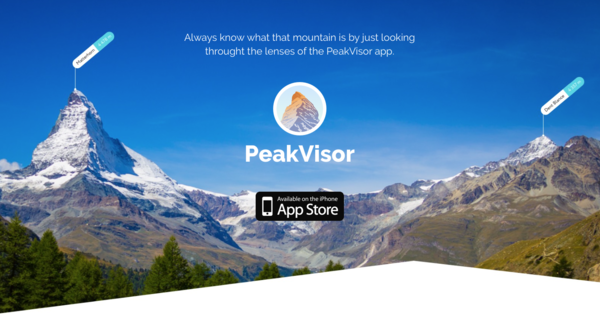 Some mountains do not need any introduction, for others there's the PeakVisor app! Ranking traditional icons of Switzerland by their increasing size may look like this: Swiss watch, Swiss knife, Swiss chocolate, Swiss cheese, and Swiss bank. 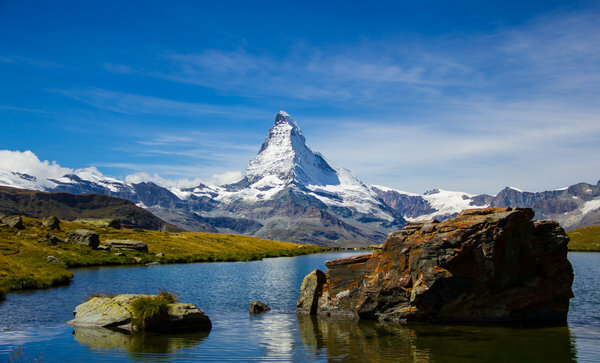 But the largest icon of Switzerland —Matterhorn Mountain — caps the list. As the most recognized mountain on the European continent, the roughly chiseled rock pyramid of the Matterhorn serves as a defining geographical landmark. With a near perfect pyramid, its absolute symmetry demarcates the exquisite nature of this beautiful mountain. Nestled in the Swiss Alps, birthplace of climbing, an ascent of the Matterhorn hearkens back to the purist traditions of climbing. 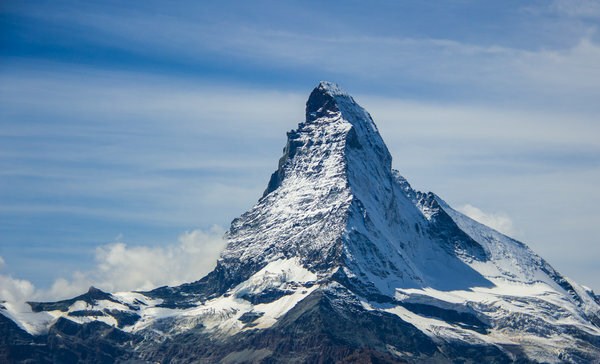 The Matterhorn, which stands over the town of Zermatt, is nearly steeple-like in both structure and magnetism. Like any other pyramid (whether it be the famous pyramids in Egypt or a bit less famous pyramidal structures in Mexico), Matterhorn Mountain is also full of mysteries and tragic stories. In terms of altitude, Matterhorn is the 6th among the Alpine peaks, but the difficulty of a climb ranks it second to none. Its faces are so deceptive, that even the most experienced climbers could not ascend them until 1865. The Matterhorn has its character. The locals say that even the weather in this part of the country depends on the mood of the legendary mountain. When the sky is gloomy and the 4478-meter tall Matterhorn peak is hidden behind the clouds, the mountain is out of humour. When the Matterhorn wants to play a joke, it pretends to be Vesuvius: clouds are covering up only part of the mountain making you believe the peak is smoking, as if before eruption. Yet, when "his highness" is in a good mood: it is showing off, gleaming with its glacier hat, as if inviting you to take an unforgettable picture of the Matterhorn. Being so impressed with the Matterhorn views we even choose it as the main symbol for the PeakVisor app. So, from now Switzerland and the PeakVisor app share Matterhorn as their symbol! While you might not need the PeakVisor app to distinguish Matterhorn, you will need it for many more mountains in the world which are not that famous. 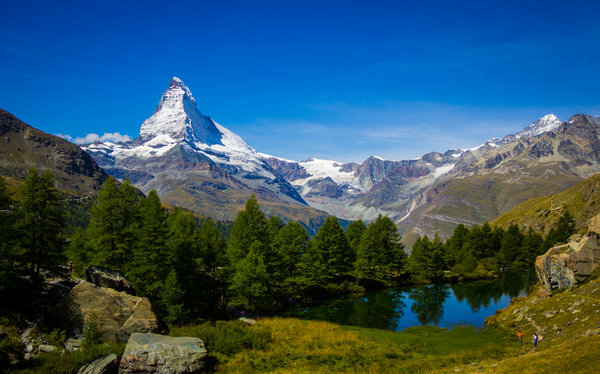 According to the modern stats (1999), Matterhorn has two distinct summits situated at either end of a 100-metre-long (330 ft) exposed rocky crest which forms the Swiss/Italian border. The Swiss summit, with a height of 4,477.5 m (14,690 ft), lies on the eastern end, above the Hörnli ridge which itself lies wholly within Switzerland and was the route of the first ascent. The slightly lower Italian summit at 4,476.4 m (14,686 ft) lies to the west. Height rank: Matterhorn is the 6th highest mountain in Switzerland and one of 48 Swiss peaks that is above 4,000 meters in height. Prominence: 1,040 meters (3,412 feet); parent peak is Weisshorn. Location: Valais Alps. Also called Pennine Alps. Border of Switzerland and Italy. First ascent: 14 July 1865. Matterhorn was the only remaining famous 4,000-metre peak to be conquered. Matterhorn is known under three common names. The German name Matterhorn derives from the words "Matte" for "meadow", referring to the grassy extended valley under the Gorner gorge, which has now been almost completely covered by the village of Zermatt (“zur Matt”) and ‘horn’ for "peak." The mountain is also called by the locals as “ds Hore” (“the peak”, in Zermatt dialect) or “ds Horu” (in Upper Valais dialect). Cervino, the Italian name, and Cervin, the French name, derive from the Latin words cervus and –inus meaning “place of Cervus.” Cervus is a genus of deer that includes elk. Matterhorn was first mentioned in medieval documents as “Mons Silvus”. The name later mutated into “Mons Servinus” and “Mons Servin”, and finally became “Cervin” in French and “Cervino” (1581) in Italian. 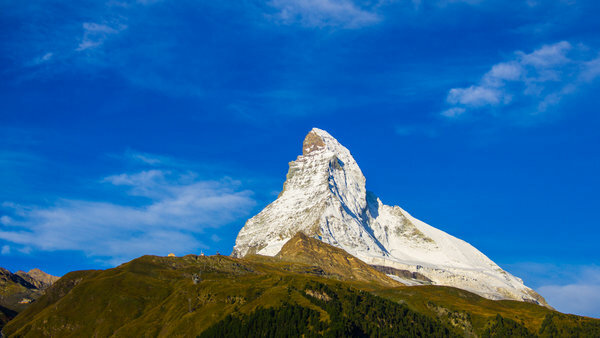 The German name “Matterhorn” first appears in 1682. The Alps cultural variety in general offers a great profusion of names, this is a mountain range stretching across linguistic and topographical borders, dividing nearby communities and giving birth to myths and dragons, devils and lost Roman legions. Besides the Gargantuanian landmarks like Matterhorn, Monte Rosa or Mont Blanc, you can find a Virgin here (Jungfrau), the Devil's Ninepin (Quille du Diable), Pilatus Mountain, Rigi and many more. The names and stories connected with them are so abundant that they make your head go round. To unpuzzle the great naming mysteries, read our blog and use the PeakVisor app. 3. What’s in the shape? Thanks to its shape and its freestanding position, Matterhorn is considered to be the epitome of a mountain. There is no better-known mountain in the world whose natural shape is so close to a pyramid. The four faces of the Matterhorn strictly face the four cardinal directions—north, east, south, and west. The ridges splitting the faces are called the Hörnli, Furggen, Leone, and Zmutt. The formation of the Matterhorn and the whole Alpine range started with the break-up of the Pangaea continent 200 million years ago into Laurasia (containing Europe) and Gondwana which included most of the landmasses which make up today's continents of the southern hemisphere, including India, Antarctica, South America, Africa, Madagascar, Arabia, Australia-New Guinea and New Zealand. While the rocks constituting the nearby Monte Rosa remained in Laurasia, the rocks constituting the Matterhorn found themselves in Gondwana, separated by the newly formed Tethys Ocean. The Matterhorn is mainly composed of gneisses from the Dent Blanche nappe, lying over ophiolites and sedimentary rocks of the Penninic nappes, the gneisses being originally fragments of the African Plate before the Alpine orogeny. The current shape of the mountain is the result of cirque erosion due to multiple glaciers diverging from the peak, such as the Matterhorn Glacier at the base of the north face, forming a horn. Between 1865 and 2016, an estimated 500 climbers died on the Matterhorn, it is 10-15 deaths per year. Deaths are due to falls, inexperience, underestimating the mountain, bad weather, and falling rocks. Many of the mountain’s victims, including three from the first ascent disaster, are buried in Zermatt’s downtown cemetery. Every year, between 300 and 400 people attempt to climb the peak with a guide; about 20 fail to reach the summit. Roughly 3,500 people tackle the Matterhorn without a guide each year; some 65% turn back en route, usually because of lack of fitness or an insufficient head for heights. Poor weather also often plays a role: conditions change very quickly (plummeting temperatures, storms). Air Zermatt, founded in 1968, is frequently called to make rescues. On a day with ideal conditions, up to 300 mountaineers tackle the “Hore”. By the way, the summit climbers usually carry approximately 8-10kg backpack, so if you wish to accomplish the route – train with more weights. The four main ridges separating the four faces are the main climbing routes. The classical route lies along the Zmutt ridge (Zmuttgrat), between the north and west faces and aligned towards the Wandfluehorn. The hardest is on the south side separated from the east side by the Furggen ridge (Furggengrat), which is aligned towards the Klein Matterhorn. The shortest route now draped with many fixed ropes, but a far superior climb compared with the Hörnli is the Lion ridge (Cresta del Leone), lying between the south and west faces and aligned towards the Dent d'Hérens (the Italian normal route and goes across Pic Tyndall). The least difficult technical climb and the usual climbing route, the Hörnli ridge (Hörnligrat), lies between the east and north faces and is aligned towards the Oberrothorn above Zermatt. The usual climbing route is up the Hörnli Ridge on the northeast, graded 5.4, involves 4,000 feet of climbing, mostly scrambling on rock (4th Class) but with some snow depending on conditions, and takes 10 hours round-trip. Some of the climbing is very exposed and climbers need to be skilled at climbing rock with crampons on their boots. The route, often guided, is difficult but not for adept alpinists. Fixed ropes are left on difficult sections. Route finding is tricky in places, especially on the lower section which is usually climbed in the dark. The descent, when most accidents occur, takes as long as the ascent. Most climbers begin their ascent by 3:30 in the morning to avoid summer thunderstorms and lightning. 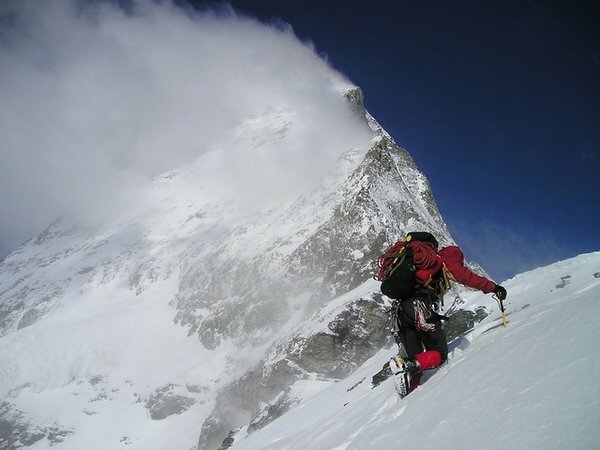 On September 6, 2007 Zermatt guides Simon Anthamatten and Michael Lerjen ascended and descended the Hörnli Ridge in a record time of 2 hours 33 minutes. Their ascent time was 1 hour 40 minutes and the descent 53 minutes, compare that to the usual seven to nine hours required by fit climbers. The previous record of three hours was set in 1953 by guide Alfons Lerjen and Hermann Biner, a 15-year-old Zermatt boy. The shortest time for covering all four ridges in 19½ hours was registered by Swiss Guides Arnold and Graven completing two full traverses. In 1995, B. Brunod set the record for the fastest ascent reaching the summit in 2 hours, 12 minutes and 29 seconds from the village of Cervinia. On August, 21, 2013, Kilian Jornet, a 25-year-old Catalan mountain runner and climber, set a new speed climbing record on the Matterhorn. He sprinted up and down the mountain in a mere 2 hours, 52 minutes, and 2 seconds, shaving 22 minutes off the previous round-trip speed record set by Italian Bruno Brunod in 1995. Jornet left the village church at 3 p.m. and reached the summit via the Lion Ridge (southwest ridge) in 1 hour, 56 minutes, and 15 seconds. The first woman, Lucy Walker (British) climbed Matterhorn on July 22, 1871. When she got word that her rival Meta Brevoort, a fellow climber failed to summit a few years earlier due to bad weather, Walker made a beeline for the mountain and started climbing. Soon, news of Walker's success spread across the globe. Undeterred, Brevoort made a successful climb to the summit too. She reached the top just a few days after Walker and became the first woman to reach the summit via the Italian side of the mountain. The first ascent of the North Face in by Franz and Tony Schmid in 1931 and W. Bonatti’s a solo winter ascent on a new direct route of the North Face in 1965. The biggest number of climbs belongs to Hermann Perren, a mountaineer and a guide. His goal was to ascend the mountain 150 times, but he fell and died 10 ascents short of his goal. By 1865, Matterhorn still remained unconquered. It is not the highest summit: Monte Rosa, almost directly opposite, is higher by almost 170 metres was first climbed in 1855. Yet the mighty rock pyramid had so far defeated all would-be conquerors. Each unsuccessful climb boosted the mountain’s aura of invincibility. In 1862, John Tyndall was the first to climb the south-west shoulder, today’s Pic Tyndall, together with the guides Bennen, Anton Walter, Jean-Jacques and Jean-Antoine Carrel. The continuation of the ascent along the Liongrat ridge seemed impossible to him. In July 1865, there were two rivalling groups trying to reach the summit: a Briton Edward Whymper happened to learn from a publican in Breuil that J.-A. Carrel had set off for the Liongrat ridge again – without informing Whymper (who by that time had already tried five times to conquer the summit). Whymper felt he had been deceived, and hurried to Zermatt in order to assemble a group for an immediate attempt via the Hörnligrat ridge. On 14 July 1865, Whymper’s 7-man team completed the first ascent of the Matterhorn. The group climbed onto the shoulder over the Hörnligrat ridge and, further up, in the area of today’s fixed cables, diverted onto the north face. Edward Whymper was the first to reach the summit, followed by the mountain guide Michel Croz (from Chamonix), the Reverend Charles Hudson, Lord Francis Douglas, Douglas Robert Hadow (all from England) and the Zermatt mountain guides Peter Taugwalder senior and Peter Taugwalder junior. They spotted Carrel and his group far below on the Pic Tyndall. As the climbers were descending again, and while still above the so-called “Schulter” (“Shoulder”), the four leading men in the rope group (Croz, Hadow, Hudson and Douglas) fell to their deaths on the north face. Three of the dead were recovered several days later on the Matterhorn Glacier, but the remains of Lord Francis Douglas were never found. Carrel also reached the summit three days later (July 17, 1886) by traversing from the north end of the Italian shoulder across the upper west face and onto the Zmuttgrat ridge (the so-called Galleria Carrel), and then completed the ascent along the ridge. 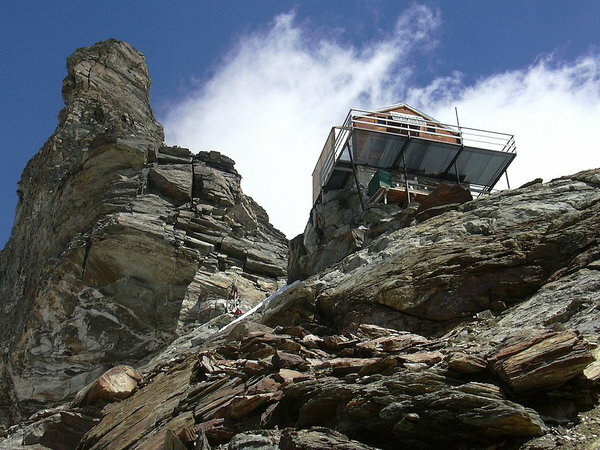 There are two refuge huts on Matterhorn slopes: the Solvay Hut built in 1915 at 4003-meter altitude. It can fit about 10 people in case of emergency during summiting the mountain. The second hut is Rifugio Carrel on the Italian side. A bit lower stands the Hörnli Hut at 3,260m, home to the Matterhorn Base Camp (reopened in 2015 after a full renovation) and the Matterhorn mountain inn. Regardless the huts and efficient rescue teams operation, the ascent of the Matterhorn is very challenging and can only be achieved by sure-footed expert mountaineers with excellent equipment, good head for heights and a competent guide. Some guides also advise you to take a lower preparation climb before you go to Matterhorn. The town of Zermatt (situated at 1600 meters altitude) is one of the most popular ski resorts in Switzerland. Zermatt even has a so-called sunrise train, which takes you to the Matterhorn peak to witness the sunrise of unparalleled beauty. 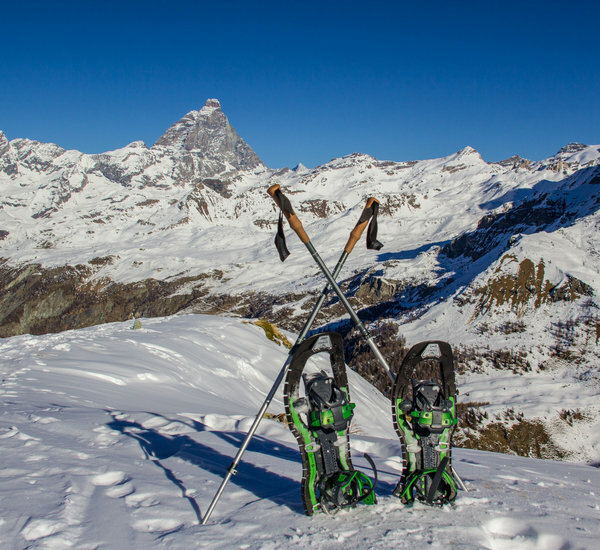 The southern slope of the Matterhorn is home to a small town called Brueil Cervinia, an extremely popular ski resort in Italy located at 2006 meters above sea level. It does not need to compete with Zermatt. They simply have to accept the fact that they share the mountain. That is why both resorts have shared ski routes, tourist routes, and a great number of tourists coming here for an active outdoor time and ski tourism in the Alps. 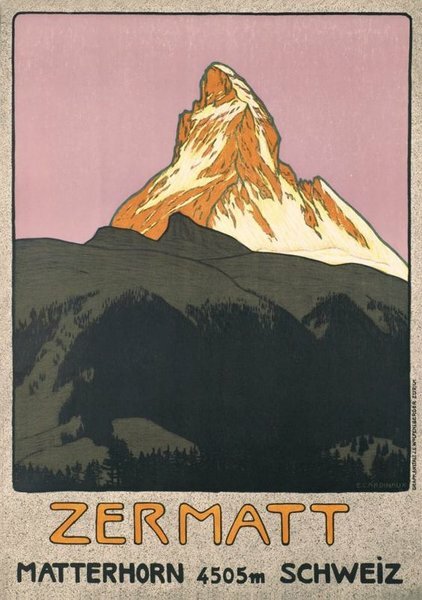 Emil Cardinaux’s striking poster of the Matterhorn, designed as a card in 1903 and printed as a tourism poster for Zermatt in 1908, is considered the first modern travel poster and a landmark of 20th-century design. 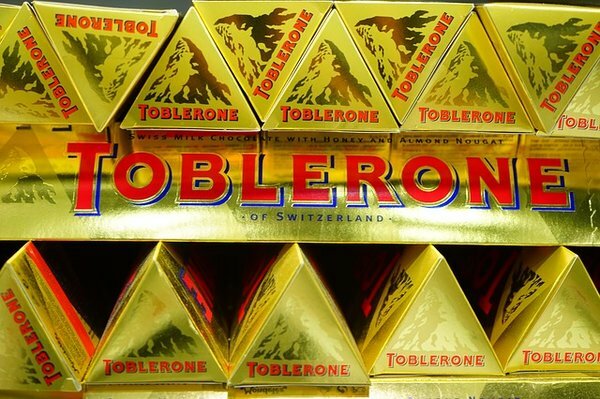 The poster image of Matterhorn appeared on Toblerone chocolate bars in 1960. Even if you are not a die-hard alpine climber, you can still enjoy the routes nearby. All you should have is a pair of good boots and a camera. A scenic route nearby is the so-called 5-Seenweg (Five Lakes Walk). 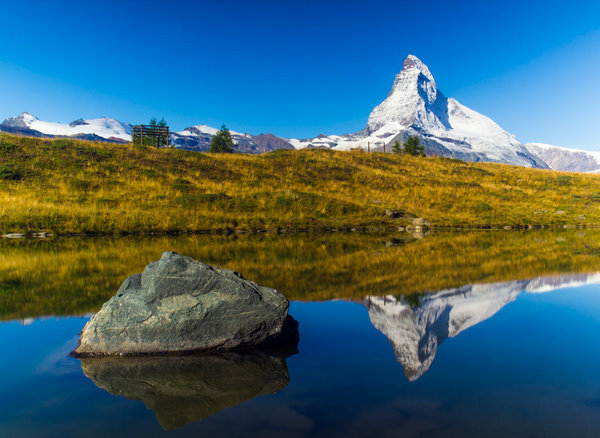 It is a 9.3 km long walk with the superb views of the mountain lakes; Matterhorn is reflected in three of them. Spend about 2h 30 min there and 2h 50min back from June to September to get the best experience. The path leads past the lakes of the Stellisee, Grindjisee, Grünsee, Moosjisee and Leisee. Each of them is very different in terms of shape, colour, character and size, and has its own special attraction. The Leisee is good for swimming: children love it and Zermatt’s beach is on Leisee. The Grünsee looks out over a rather more rugged landscape, where Swiss stone pines nevertheless manage to grow among the scree and sand. The Grindjisee (2,324 m) is a lake of mysterious beauty. Its still surface mirrors the Matterhorn and a pair of larches. The area is heaven for alpine flower enthusiasts. The Stellisee (2,537 m) is among the most famous of Zermatt’s lakes. The sight of the Matterhorn reflected on its mirror-like surface is breathtakingly beautiful, and is made for magnificent photographs. Alternatively, mount Camino walk or Belvedere Cheneil trail will give you a 360-degree view of the underlying Po valley (if there are no clouds) and majestic Matterhorn and Monte Rosa peaks from the southern side. Santuario de la Clavalité is also located near the ski-lift station, and can be reached on foot as well. Belvedere Cheneil is an easy (snowshoes) walk from Cheneil to the Punta Fontana Fredda (2,513m) and Belvedere Cheneil viewpoint. You can take a free elevator from the parking area to the village of Cheneil. About halfway to the summit of Punta Fontana Fredda (literally, a tip of a cold fountain) trees disappear and free ride skiers paradise begins. 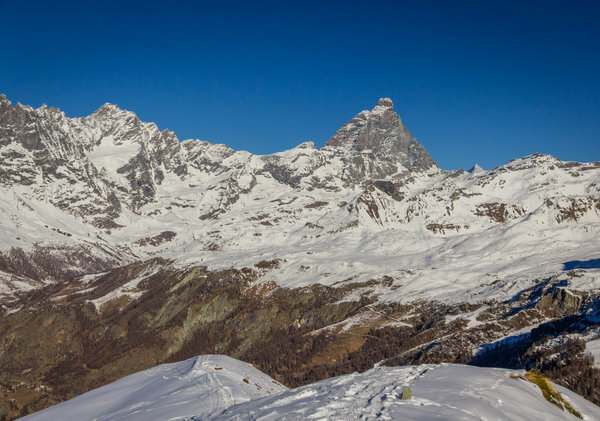 From here, you can see Matterhorn, and the Grandes Murailles chain to the left from it and the adjoining peaks: Monte Roisetta and Grand Tournalin. To make sure you never again confuse the mountains, use the PeakVisor app and learn much more about the Alpine treasures (e.g. Grandes Murailles, Dent Blance etc.). 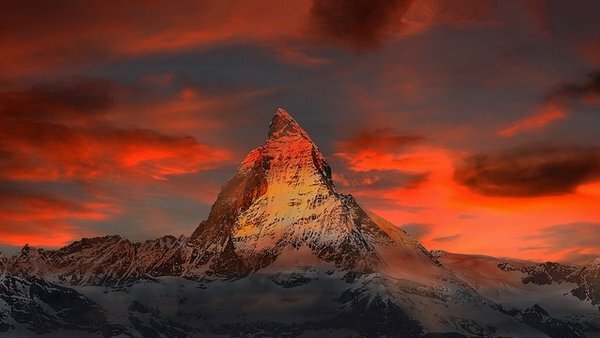 There is a saying: everyone, who sees Matterhorn Mountain, will be successful and wealthy. Perhaps, this is the reason why Swiss banks have so much money in their vaults. 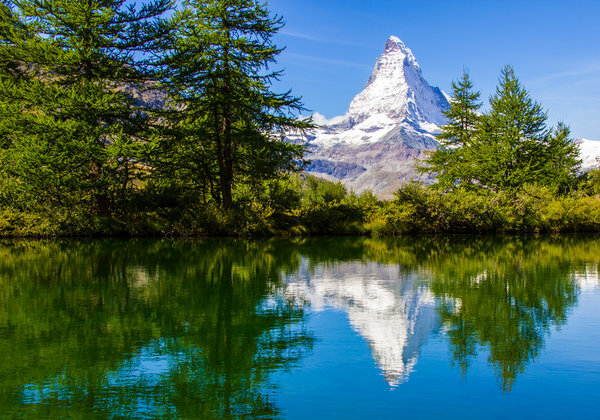 Come visit Matterhorn, the famous landmark of the nature of Switzerland, and who knows, the local saying may just come true for you.